The nerines are looking wonderful in the rockery. These autumn flowering South African bulbs are members of the amaryllis family and are a mainstay of our April garden. There are a number of different species (about 30, apparently) but it is the large flowered, showy sarniensis hybrids which we feature. Felix Jury imported some bulbs and did quite a bit of work to extend the colour range here. He particularly favoured the smoky burgundy colours but we also have a shocking pink which is near iridescent, along with a whole range of different reds, oranges, pinks and corals from pastel to verging on purple and even apricot. They are grown as a cut flower commercially but we prefer them in the garden setting. These are large bulbs which are planted to half depth only with their necks exposed and they are happy with summer baking. Their strappy leaves come after the flowers and hang on until spring. 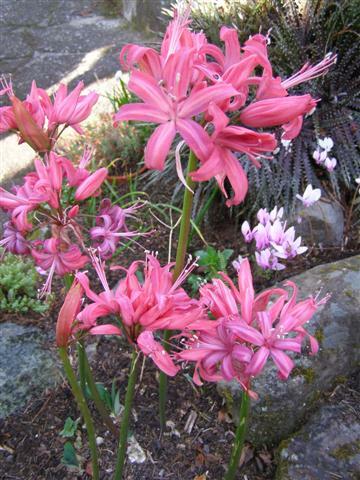 Nerines are sometimes called the Guernsey lily or the Spider Lily. Some of the other species have much finer, more spidery flowers than the sarniensis types, but lilies they are not. Neither do they originate in Guernsey though that island became renowned for its cut flower production and the bulbs have since naturalised there. Nerines were named after Nereis, a mythological Green sea nymph. This entry was posted in Plant collector and tagged Abbie Jury, autumn bulbs, Guernsey lily, nerine sarniensis, spider lily on 23 April 2010 by Abbie Jury.